Retirada De La Reforma Laboral -- Ni Un Paso Atrás En Las Pensiones, Ni En La Negociación Colectiva -- Contra La Dictadura De Los Mercados Por Nuestro Derecho A Vivir Dignamente. The Mandate Of September 29th. 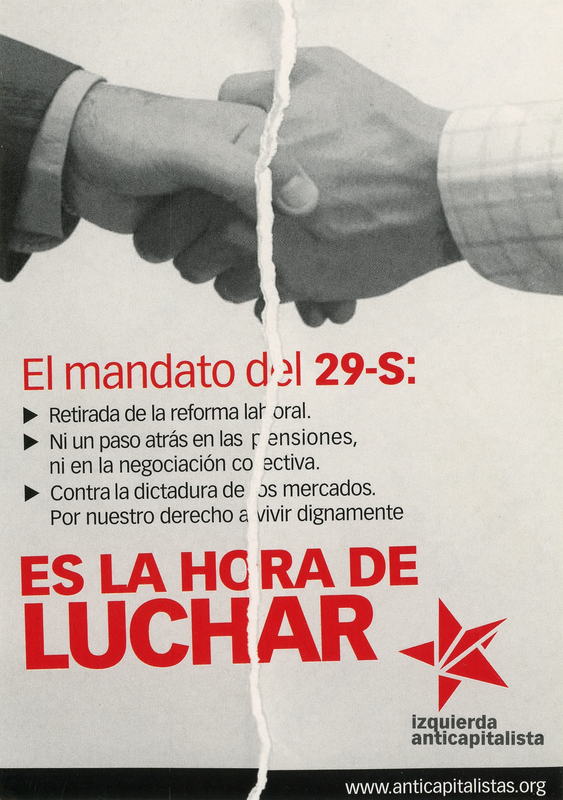 Removing The Labor Reform -- Not One Step Back In Pensions, Nor The Collective Bargaining -- Against The Dictatorship Of Markets For Our Right To Live In Dignity . The sticker shows the shaking hands of two males seemingly wearing suits or collared shirts. This strike was organized in collaboration with three trade unions, the Worker's Commission (CCOO), the General Confederation of Labour (CGT) and the General Union of Workers (UGT). The strike was against labor reform, salary reduction in the public sector and the freezing of pensions.